Ipswich, along with most town centres nationally, has felt the effects of on-line retailing and a general migration away from town centre shopping. This problem was compounded in 2012 when Waitrose and John Lewis chose out of town centre sites for their major new stores. At a public meeting in 2013 Sir Stuart Rose, one of the country’s foremost experts in retail strategy, was highly critical of the town centre but subsequently provided very valuable advice and support to the town’s improvement initiatives. One of these initiatives had been to form a Business Improvement District (BID) for Ipswich, a BID is defined as a geographical area where local businesses elect to pay an additional levy to fund projects within the district’s boundaries. 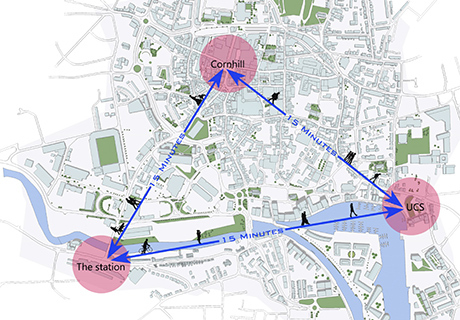 Ipswich Central was formed as a limited company to implement the projects identified as part of the Ipswich BID. At the time of Sir Stuart’s public criticism, the Ipswich BID had been in place for some years but it was the impetus given by his criticism that spurred the town on to further action. Sir Stuart worked closely with the then Ipswich Central executive director Paul Clement to produce a ‘Vision for Ipswich’ aimed at identifying practical ways to revitalise the town. 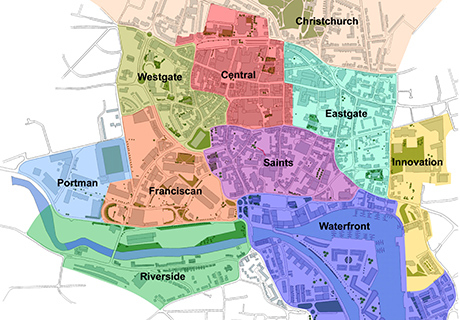 As a result ‘Turning Our Town Around’, was released in July 2015 setting out a practical and innovative approach to re-shaping the town centre, concentrating retail on a north-south axis linking the traditional town centre with the newly vibrant Waterfront and identifying a series of ‘quarters’ within the larger central area, each with its own recognisable character. 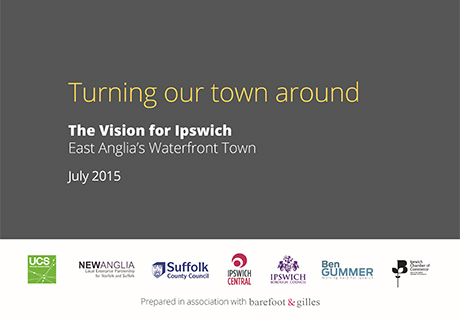 Barefoot and Gilles was appointed by Ipswich Central to produce ‘Turning Our Town Around’, a report which combined the input from a wide range of local stakeholders and illustrated the policies that had been agreed. Although we were not directly involved in the negotiations between the various parties our input involved editing the text and illustrations in response to an evolving manifesto and we were also given the opportunity to put forward proposals of our own for the identity of various ‘quarters’ within the town. Over time a coherent statement of intent emerged although the process itself involved analysis, innovation and more than a little diplomacy! The report was significant in that it was the first attempt for some time to set out an overall ‘vision’ for the town, concentrating on the character of the public realm to produce a deliverable programme of changes which collectively will change the public’s perception of Ipswich.